When it’s so hot you can’t think of anything you’d like to do more than put your feet in some water (bucket, ocean, lake, bathtub, whatever) and your nose in a book, it’s daunting to go to the bookstore and look at the miles and miles of options. Fear not! We’ve got the hottest romance books for the end of summer picked out for you. These five hot romance reads for summer will make you smile. There are bridezillas, reconciliations and take-me-away-right-now vacations that will allow you to spend your day in relaxing, readerly bliss. Have you tried a digital book before? The convenience factor will knock your flip-flops off. You can buy a device meant just for reading or download a free app from Amazon or Barnes & Noble for your smartphone or computer. While no one is hauling their laptop to the beach, you would be amazed how much you will enjoy reading on your phone when you have a few minutes in line — or a few hours on the sand. Try Exclusively Yours by Shannon Stacey, a digital book (meaning it’s not in print no matter how hard you look) from Carina Press, the new digital-first department from Harlequin LTD. Exclusively Yours is a mix of everything perfect for summer: A Hollywood entertainment reporter has to get an exclusive interview with a reclusive bestselling author who, back in the day, was her high school love, and a man she’s never forgotten. When he challenges her to survive a vacation in the woods with his family, offering one question for every day she survives with them, she accepts, and both of them wonder what they got themselves into. Exclusively Yours is available now at several digital bookstores, and you should be able to download and start reading within moments. 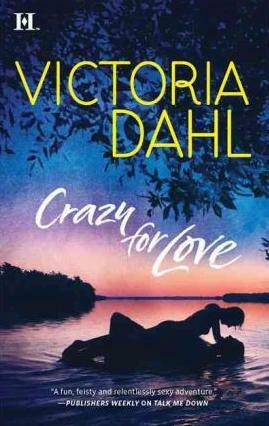 When Chloe Turner’s fiance fakes his own death to avoid marrying her, the heartbreak and the media onslaught drive her to a deserted island for a much-needed escape. When Chloe meets treasure-hunter Max, who is on vacation with his brother Elliott, he thinks he has finally met someone normal and calm — but when the cameras pop out of the sand dunes, he finds out he is so wrong. 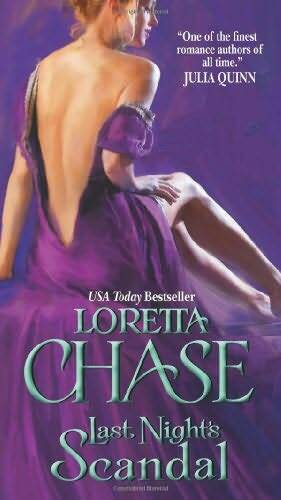 Loretta Chase is one of the very best writers in romance. Olivia and Lisle have known each other for years, but their friendship takes place over long distances. He lives in Egypt as an archeologist and she’s in London under the watchful guard of her family. Olivia has a habit of getting into dramatic trouble and longs for adventure. When Lisle comes back to England only to find himself sent north to a cold Scottish castle that’s reputed to be haunted, she schemes a way to have a few weeks with him before he heads back to the (much) warmer desert sand and takes her heart with him — again. Hot Finish just came out on August 3 and is the third book in a series. But you can read Hot Finish without reading the other two. But to really appreciate the hot men, smart women, and amazingly funny writing, treat yourself to all three. McCarthy’s series takes place in a world of stock car racing — but put aside everything you thought you knew about the drivers and the women who cheer them on. 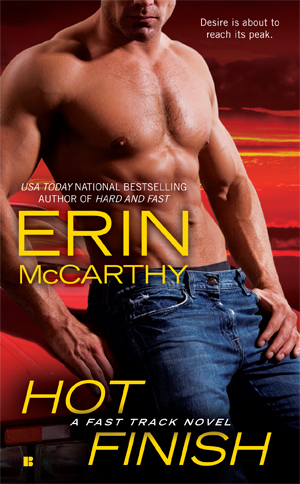 Hot Finish is the story of Suzanne Jefferson, who is planning a wedding for a bridezilla from hell, only to find out her ex-husband, Ryder, is the best man, and that, due to a missing signature, they’re not actually divorced. This book is funny, smart, and touching — a perfect combination. And did I mention hot? It’s hot. Really, really hot. Released at the end of July, All I Ever Wanted is about Callie Grey who has been in love with her boss Mark for years, ever since he was her first kiss back in high school. When he hires and then proposes to a woman of icy perfection, Callie decides it is long past time to move on. Her next PR project is helping the new town veterinarian get to the know the community, even though he’s remote and rather icy himself. 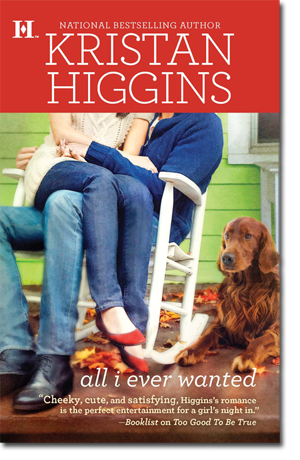 But when she gets to know him, she realizes that she might have been wrong about who her perfect man might be. Romance is often dismissed as mindless dreck with predictable plots, but really, the best of romance is far from mindless and silly. Each of these books — and many others — feature savvy, sharp women, and stories that won’t let go of you. So they are perfect for a hot, sunny day when you want to relax and escape for a few hours to find your own happily ever after.